August | 2013 | Hike. Camp. Hike. 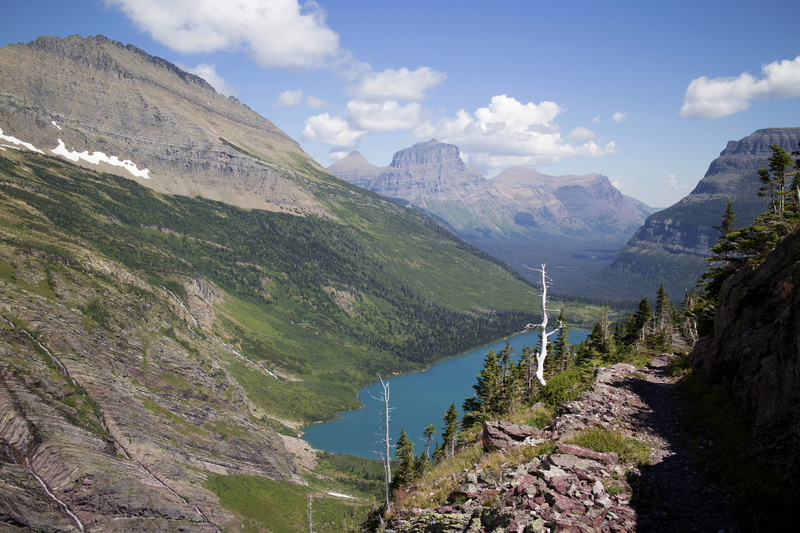 2013’s Big Trip to Glacier National Park! This was Hike.Camp.Hike’s Big Trip of 2013 – if you read the about page you’ll understand what I mean. Glacier National Park is completely breathtaking both with it’s gorgeous scenery and it’s sometimes steep and challenging trails. You’ll get the idea when you look at the photos although I highly recommend seeing this in person! Friday Hike: North Fork area, Bowman Lake, Numa Trail – out and back for a 12 mile hike. Saturday Hike: Lake MacDonald area, hiked Sperry Trail to Sperry Campground and camped overnight for a 6 mile steep hike. Campsite: We had campsite #2 in the Sperry Campground, #1 looked slightly better but was taken. There are only 4 spots in this campground. If we do it again and the weather cooperates the campground at the Ellen Wilson Lake along the Gunsight Pass Trail looked incredible and completely empty. Camp Lunch: Since this was a backpacking trip our food selection posed different challenges than our car camping hikes. Choices need to be as mush-proof as possible, nonperishable and hopefully light in weight. My selections included bagels and peanut butter, Naan bread and cheese rounds. Snacks were Kind Bars, nuts, banana chips, chocolate and GU which saved me many times along the hike when I was feeling out of energy. @camp: place bag in a bowl and just enough water to core. let stand 5-10 minutes. Stir in the chicken and serve. Night 2: The night we camped out we had reservations at the Sperry Chalet for dinner. It was really tasty especially the desert! And we didn’t have to worry about carrying the jetboil or food for dinner on the trip which lighten the load. Highlights of Day 1: Arrival at Evergreen Motel, a visit to the backcountry permit center for our permit, on to Polebridge, and a hike to Numa Lookout 12 miles out and back. Sperry Trailhead with rain gear. (JP) Before to far up the trail we were brave enough to take off the rain gear and had a sunny hike for the rest of the trip! (JP) Kelly taking a break along the trial. (KF) Horses on their way back from the Sperry Chalet. (KF) An optional hike to see the Sperry Glacier is a 3.7 mile hike that starts at the Chalet. (JP) Kelly ready to take on Gunsight Pass Trail from the Sperry Chalet. At the Sperry Chalet before the Gunsight Pass Trail hike to Jackson Glacier Overlook. (JP) Lake on the way to Lincoln Pass. (JP) Our first view of Lake Ellen Wilson coming from Sperry campground. (JP)Maria, Catherine, Kelly along the trail. (JP) Maria with Lake Ellen Wilson in background. (KF) Mom and baby take off. (JP) We decide to take off our shoes to cross so they won’t be soaked for the rest of the hike. (KF) Judy getting started across the waterfall. (JP) Catherine hiking up to Gunsight Pass. (JP) Looking down to Lake Ellen Wilson from below Gunsight Pass. (JP)More waterfalls on our way to Gunsight Pass. (JP) Maria at the shelter at Gunsight Pass. (JP) Kelly capturing a shot of a marmot. (KF) Marmot is not shy. (JP) Beyond the Gunsight Pass on our way to Gunsight Lake. (JP) Another waterfall that required some rain gear to get past unless you wanted to be soaked. (JP) Snow field along the trail between Gunsight Pass and Gunsight Lake. (JP) Patterns in the rock of the mountains surrounding Gunsight Lake. (KF) A moose in the St. Mary river spotted on the hike back to Jackson Glacier Overlook.